Shell's Stories: Bookshelves! Aka Pictures of Bookcases #4, #5, and #6! Bookshelves! Aka Pictures of Bookcases #4, #5, and #6! 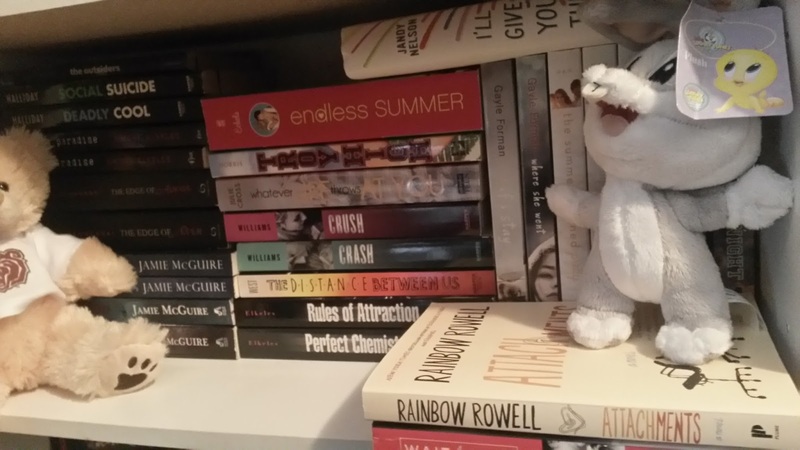 It’s time for me to share bookcases #4, #5, and #6! If you didn’t see bookcase #1, #2, and #3 in all their bookish glory, you can check them out on the blog. For those of you who don’t know, I moved to NYC this past summer. Moving meant I couldn’t take my books with me. Thus, I left 99% of my books at my parents’ house. It’s sad to be away from my preciouses for so long. On days that I don’t have other posts planned, I’ll share photos of a bookcase. Well, in this case, I’ll share photos of my smaller bookcases. This will be bookcase three, four, and five. 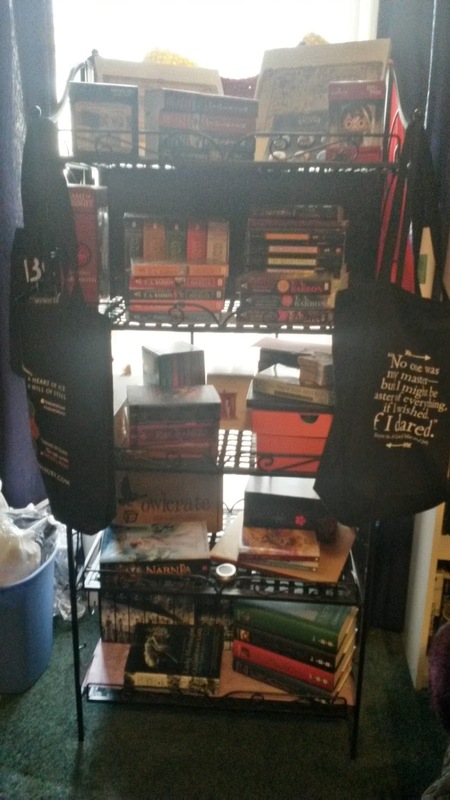 They primarily hold my contemporary, fantasy, and children’s books, but I also have some other stuff on them. Let’s start with the contemporary bookcase. 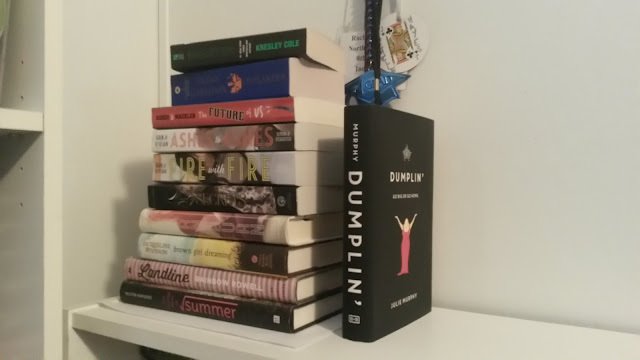 The very top shelf on this bookcase is a stack of contemporary TBR books. 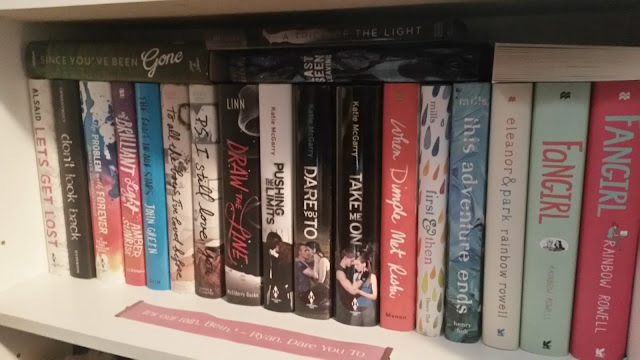 There used to be a lot more on this shelf, but I got rid of a lot of titles in my unhaul.I just don’t read a lot of contemporary anymore. The first actual shelf contains my YA contemporary hardcovers. There’s some Rainbow Rowell, Jenny Han, and Katie McGarry. Below that shelf are contemporary paperbacks, like Jamie McGuire, Jenny Han, and Gayle Forman. 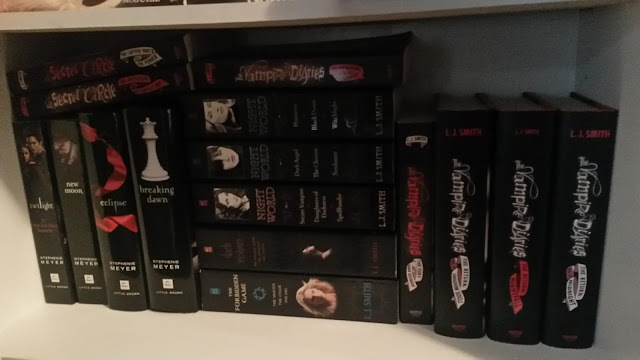 The bottom shelf on this case (it’s only a three-shelf bookcase) contains my Twilight and L.J. Smith books. My window is right behind this bookcase, so the sun made taking this pic very difficult. Currently, it holds my Narnia collection, boxsets of Cassandra Clare’s books, Tolkien books, and T.A. Barron books. After that, there’s the closet bookcase. Inside my closet, I have a bookcase my dad gave me. It holds mostly middle grade and children’s books along with the romance novels I don’t want my parents to see. Not that I’m ashamed of the books, I just really don’t want to explain what they’re about to my parents. Ick. It's super dark in my closet, so I had to use a nightlight for the pic. So, the first shelf contains some Gail Carsen Levine, Amanda Marrone, and Cara Lynn Shultz. 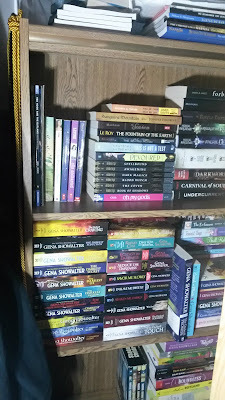 The middle shelf contains mostly Gena Showalter, J.R. Ward, and Kresley Cole mass market romances, while the bottom has some signed or special ARCs and a boxset of Margaret Peterson Haddix’s Shadow Children books. Whew, well that’s the last of the bookcases that I have at my parents’ house. Soon I’ll show you the bookcase I have in my NYC apartment. 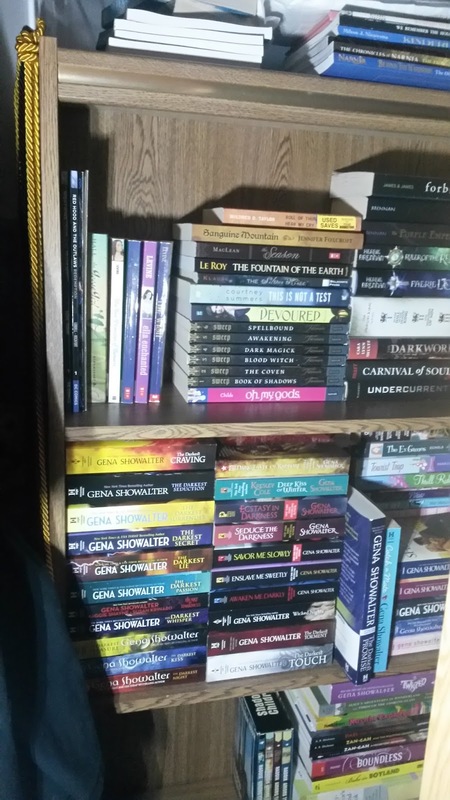 Do you organize your books by genre? Let me know in the comments! Bookshelves! Aka Pictures of Bookcase #7!